Freeport-McMoran $FCX +8% After Earnings, Where Now For the Copper Giant? Freeport-McMoRan $FCX, the world's biggest publicly listed copper producer, released its quarterly results before the markets opened on Tuesday. $FCX swung to a profit in 2Q17 after the loss the year earlier. Freeport-McMoRan has been benefiting from the strength in commodity prices. Overnight London copper struck its highest level since mid-February after unexpected strength in China's economy and a weaker dollar. Earnings: Net income came in at $268MM, or $0.18 per share, from a loss of $479MM, or $0.38 per share, a year ago. Adjusted earnings were $0.17 per share. Revenue grew 11% YoY to $3.71Bil. FCX missed the consensus EPS estimate of 20 cents, but revenues beat the consensus estimate of $3,678 million. Gold sales of 432 thousand ounces during 2Q17 were slightly lower than the prior estimate of 440 thousand ounces. Copper sales of 942MM pounds were also lower than the prior estimate of 975MM pounds. Molybdenum sales of 25MM pounds came in slightly higher than the estimate of 24MM pounds. The Q217 follows on for the turnaround in Q117 with an adjusted profit of $0.15 per share up from an adjusted loss of $0.16 per share in the year-ago period. (FCX earnings reports have a lot of adjustments). The rise in Q1 was largely due to a 22.5% increase in the realized price for copper. Those levels remained strong in 2Q17. Copper futures averaged around $5,668 per tonne during 2Q17. North America FCX expects copper sales be 1.5 billion pounds in 2017, compared with 2016 1.8 billion pounds. South America expects copper sales of around 1.2 billion pounds in 2017, compared with 1.3 billion pounds in 2016. Indonesia expects copper sales of around 1 billion pounds of copper and 1.6 million ounces of gold for 2017. Valuing $FCX as an investment, or a short for that matter means understanding what they went through since 2011 and what they have done to dig out of that hole. There is of course the all important stock market and commodity specific risk to consider all so. Freeport's earnings have been hammered by write-offs, in 2016 the company reported a loss of $4.1 billion, or $3.16 per share. What saved them was they still had $3.7 billion of operating cash flow. Unfortunately for FCX they were not able to benefit from the copper prices as much as they would like in Q217 as copper sales have declined to under 3.9 billion pounds from 4.65 billion pounds in 2016. This has much to with asset sales, quality assets sold off to pay down debt. $FCX company has a massive hole of unproductive debt, yes it has been cut down but is still huge and good assets have gone as we saw with copper sales. Net debt is down from $20 billion to $11.8 billion over the past year. The forecast is for its leverage ratio to average around 1.5 times this year, high in a cyclical bear commodity market. Where the massive debt and losses come from is a concern for investors as the question is how did commodity experts get it so wrong. In other words are they good managers? Freeport-McMoRan did two massive deals in 2012 when oil was over $100 a barrel and natural gas was at $4.50 per million Btu. The deals were for over $20 billion. Copper was $3.50 per pound and gold $1,500 per ounce at the time. Of course as history showed us that was around the peak and the commodity rout took hold. The deals were closed mid-2013 and the massive overpay has wreaked havoc. To pay down debt in 2014 it sold its Eagle Ford Shale assets to Encana $ECA for $3.1 billion. While they used half to buy Gulf of Mexico assets from Apache $APA. Earlier this year $FCX sold its California onshore oil and gas properties to a private buyer for $720 million. Freeport-McMoRan has raised only $4.4 billion from those oil and gas assets from 2012. There are some oil properties left. Thats a huge chunk gone. $FCX also had equity raisings yet the debt level was still $15.4 Billion of debt at the end of 2Q17 with $4.7 Billion in cash. Global commodity companies have another risk, geopolitical. 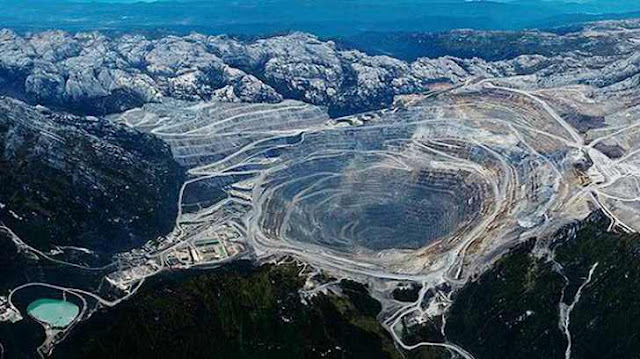 Freeport-McMoRan this year had a number of disputes at its Grasberg Mine in Indonesia (image above). In January $FCX suspended copper exports due to a contract dispute with the government. It took until April for exports to flow again. The Indonesian government agreed to allow the company to continue shipping for six months while it negotiated a new operating license with FCX. Hence the issue remains a risk and unresolved. Then as soon as exports were back on in May more than over 5,000 workers at the mine went on strike. An added risk to the mine and therefore the firm's cash flow. Of course the flipside is should Freeport-McMoRan resolve these issues, earnings keep improving and debt paid down they do appear cheap relative to their major competitors like the Australian mining giants $BHP and Rio Tinto $RIO on several measure. There is the added risk of will they replicate the same type of errors again? Are they good commodity managers?